Lying comfort designed in accordance with the shape of the body A mattress without the appropriate base can lead to tension and poor sleep – hence, a suitable bed base is indispensable. 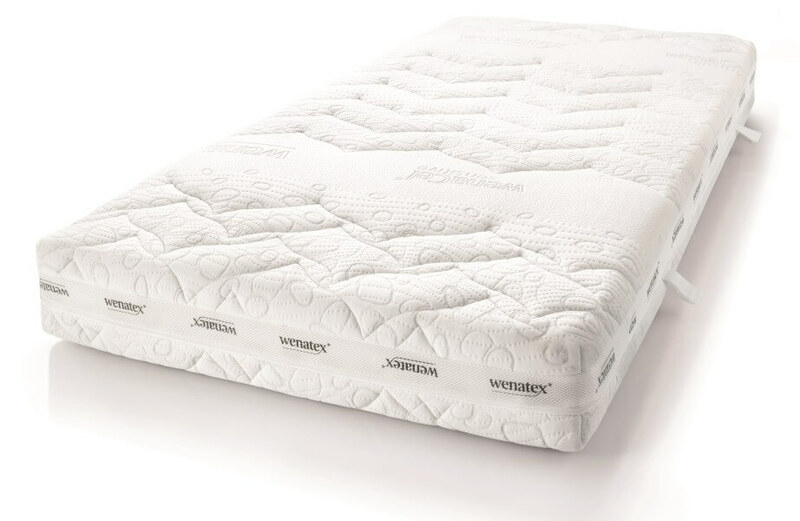 The wenaFlex® Premium Bed Base provides the perfect suspension for the wenaCel® sensitive sleep system. Every possible requirement for ergonomically correct lying support was taken into account during the development. Thus, the innovative geometry combined with the unique wenaFlex® Premium contact pads ensures optimal support and individual flexibility in 5 comfort zones. for the feet and heels. The wenaFlex® Premium bed base from Wenatex is more than just a regular bed base. With 60 three-dimensional, fully flexible spring elements and a total of 240 support points* or pads, it guarantees a particularly high level of flexibility. Each section of the body needs point for point elastic support– and that is precisely where the ergonomically designed Wenatex bed base differs from regular slatted frames: each spring element and each of the four respective contact pads provides the necessary point elastic support and yielding effect. The spring elements are provided in for different degrees of hardness: golden and anthracite contact pads for pinpoint support of the body and additional red elements that provide extra support for the lumbar area. *The number of spring elements and support points may variy depending on the size of the bed base. Care instructions for your wenaFlex® Premium Bed Base.